Hospitalized for a "Break From Reality"
Mom, Dad, and my friend Meredith tell me that we are going for a ride. When I was a baby this is how my parents would get me to fall asleep, perhaps that’s what they are aiming for. But I am restless. They say that if we go to the hospital then I will sleep. We are driving through the town in which I grew up. I know it well, but today everything looks clearer, closer. The autumn leaves are beginning to fall, making piles of red and orange on the front lawns of houses that we pass. I ask Meredith if I can wear her thick glasses; for some reason I want to see things differently. I put them on and take them off, allowing my eyes to adjust and readjust. I repeat this pattern, fixating on the red and orange. I watch as the shapes morph through the lenses of the glasses. The car is in motion but it still can’t keep up with the pace of my thoughts, or my eyes. I take the glasses on and off and it feels as though my eyes are changing, growing stronger. We arrive at the hospital quickly (as if my need to be there willed the car to move faster). I am on an important mission. The hospital will prove that I am ready to go on to the next stage of this quest and I can return to New York, to school, my friends, and boyfriend with new information. It is all very important. A week before my 22nd birthday I was hospitalized in Bryn Mawr, PA for “manic behavior” among other things. Categorizing behavior can be both helpful and problematic. No two bodies or minds are the same, and each has a different experience with trauma. What may seem small or mundane to one person could trigger or traumatize another. For me, mania was created by what I considered to be a continuously unsafe environment. 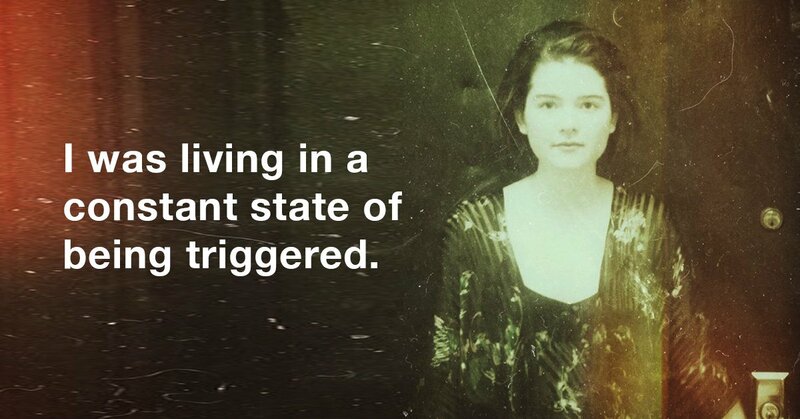 I was living in a constant state of being triggered. 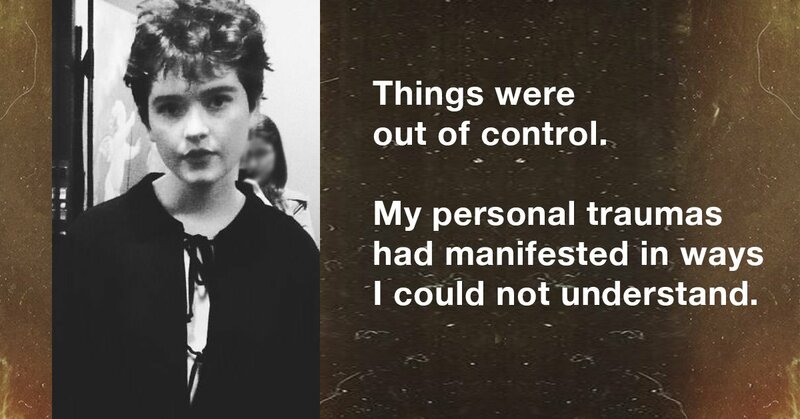 Things were out of control — my personal traumas had manifested in ways I could not understand. I wasn’t sleeping, my ideas started to blur and become disjointed. I was taking on too much in an attempt to avoid what had happened to me. This caused my thought processing to be unstable. I can say that now, but I could not say that then. I recognize now that I was unwell, and that my behavior was manic and disoriented. I was confused about what was happening to me before and during the time of my hospitalization. 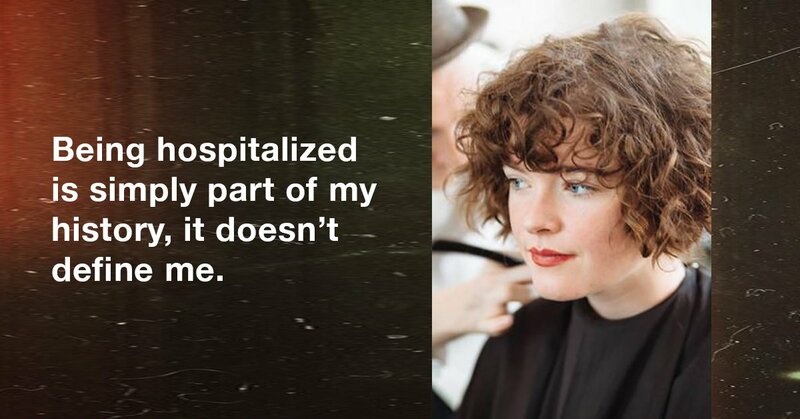 I was upset about being hospitalized, in part, because of the stigma around hospitalization. In every image we see of a woman in a psychiatric unit in popular media, she seems out of control, exhausted and exhausting. This is not to say that this was not true to my experience, but at the time it felt like I was being forced into a place and a role. I didn’t feel like I fit this role, and I surely did not want to fit this role. Patient visible on the unit, can be intrusive with peers. Appetite & ADL’s are good. Pt displaying odd behaviors such as showering in the dark and moving her mattress to the floor. Very friendly & pleasant upon approach. Attended group meeting and participated but was off-topic. A very disorganized, manic, elevated mood, hyper verbal, contracts for safety in the hospital. Provide support, monitor mood and behavior for any changes. You seemed to be struggling and trying to take on too much alone. You were upset a lot of the time. The pace of your life seemed to be altered in a significant way. You were clearly struggling, but it still seemed like a fairly typical human struggle and completely reasonable in light of all the ways in which people had abused you. Something seemed wrong the whole time, but I figured we could get through it by talking a lot and that sort of thing. The moment when it “crossed the line” was when I noticed you posting weird things on Facebook, and you started speaking to me in many illogical ways. The “breaking point” was when everyone started to call me. I began to receive calls from everyone I knew: friends, family, etc. I was also talking to you during this period, of course. This is when your manner of thinking and speaking went “over the edge,” and began to seem like it was a full on break from reality. We spoke on the phone a lot and you kept talking about all the things you had to do and writing out schedules and it seemed like you were trying to do way too much, even for someone who wasn’t experiencing a break from reality. You kept talking manically about all of your plans. I was fielding calls from all sorts of people about what was going on. Eventually Mom and Dad got to the city. I encouraged them to try to get you to go to sleep since you had barely been sleeping at all and I suspected that that was largely the source of the problem. The staff wish to extend to you a personal welcome. We recognize that being admitted to a hospital can be a stressful period for you and your family. We are available to you and will do all we can to assist you in your adjustment to the unit, and to make your stay as pleasant as possible. This booklet is designed to answer questions you may have about your hospitalization. It is important you understand the program and routines of the unit so that together, we can work toward your recovery and return to the community. If you have any questions about any aspect of the program, feel free to ask any member of the staff. Upon arrival, my thoughts were disjointed. I didn’t understand why I was in the hospital but it felt a piece of something grander, something important. I was a strange subject — manic perhaps, but something else too. That’s what trauma will do to a body and to a mind. It causes some unexplainable mental challenges. The doctors attempted to explain what was happening with my mind and that they hoped to correct it. They had me take lots of things, but first it was Ambien. I didn’t want to take anything but the doctor suggested Ambien and I complied. I rode an exercise bike on Ambien. I organized the refrigerator on Ambien, by color — aesthetically I imagine it looked nice. However, I don’t recall how it looked, or how it felt to organize the fridge or ride the bike. I was asleep. The doctor told me of the strange behavior and then had me take more pills. I soon became tired of being at the hospital. 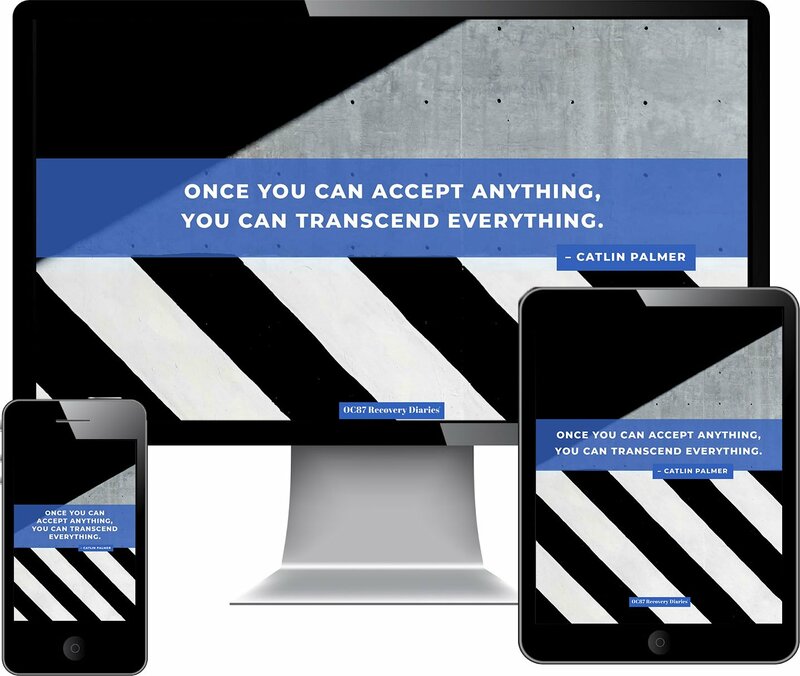 It felt completely detached from the ideas I was having and my life in general. I felt stuck and powerless. Day after day, I attended group sessions. I spoke with doctors, I participated in floor activities and meetings. I had visitors. I made many phone calls and I filled journal upon journal — I thought it was very important to document what was happening to me. I was becoming agitated with the experience of being there. I walked the hall for a bit. I wish I could dance in my room. What is the course of medication? (Why?) How long does it take? (How come?) (Is there a quicker way to leave that would feel SAFER to ME?) What is the soonest I can leave? (Should I call a lawyer? ) Who MUST pick me up? (If anyone?) Can we have a group session w/ my parents, today? I even filled out the form for tomorrow’s order. Even though I plan to leave today. I am not meant to be in a psych ward! moments of elevation, moments of upset, mania, etc. I hate the hospital. It is cold smelly and makes me sicker. I do love my friends here. I am not trying to escape but I want out. And the sad saga continues. I was previously hospitalized for physical trauma caused by an assault, and now for having a “break from reality.” I can’t see how these two experiences could possibly be mutually exclusive. However, when I discussed the violence I had encountered in the hospital group sessions, nurses often encouraged me to stay on topic or told me frankly that I was off topic. It seemed to me that the way in which I became elevated was related in part to the violence I had endured. But the doctors seemed to disagree, at least within the scope of my perspective at the time. Before hospitalization, I was hyper sensitive and not sleeping. I began to have grandiose ideas about the upcoming election. When I had not slept for four days I began to think my phone was recording everything I did and streaming it on the web. I thought people were recognizing me but I could not access what was on the Internet. There was an intricate puzzle I had to solve that involved several other people (it was crucial I found who the right people were) and that I was in the right place at the right time. Everyone was falling in love and working towards important things. I was doing the same. It was connected to the big ideas I had been having about violence and change. The ideas were oriented in self-care, trade, love, and compassion. I was finding my way but suddenly I was told that this way was wrong. I was placed in the hospital for elevated ideas, and at the time this was devastating for me. In an “art” session in the hospital, we were asked to draw trees that represented our time before hospitalization and where we were now. We had to draw two trees. My post-hospitalization tree was the only tree that looked sadder than the first tree in my entire art group. One girl, let’s call her Angelina, drew a tree that was nearly lying across the ground to represent herself before hospitalization. The tree that she drew to illustrate her life “post-hospitalization” was upright, and some teen had carved “Angelina and meds forever” into its trunk! At that point I suddenly understood that that is the truth for a lot of people. That the hospital was a safe place to explore what is going on in our bodies and minds. Though I resisted this and felt forced into it, it really was something that was meant to help me. I can understand this more and more with distance from the experience. This situation feels out of control. I am trying to be true to myself — I am peaceful but this experience is breaking me to pieces. Livin’ here ain’t easy. While I was in the hospital, I learned to have empathy for the other patients I encountered. In addition, a big part of understanding my time in the hospital was learning to have empathy for myself. 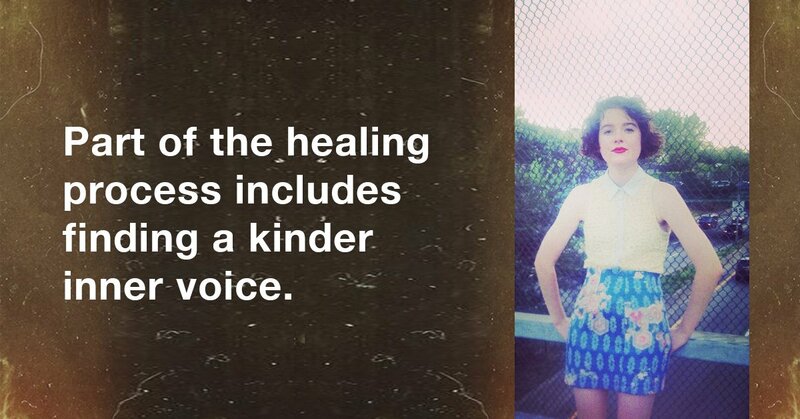 Part of the healing process includes finding a kinder inner voice. And, yes, I understand that empathy is “the ability to understand and share the feelings of another.” But self can be the “other” at times too, especially when dissociating. It is difficult to understand these other voices within ourselves — voices of anxiety, unwellness, otherness. Allowing empathy to be in communication with trauma and related triggers allows a new understanding of our own experiences. We are several pieces, selves and parts. Though being hospitalized seemed like a sudden shift in who I was, I recognize now it is simply a part of my history, and it does not define me. However, I am aware that in order for me to move forward in life, I must always check in with how I’m feeling, what I’m thinking, and be conscious of my past traumas. I'm at peace with the fact that I unlocked my secrets about living with bipolar disorder. I'm not the first one to be bipolar, and won't be the last.